Last year, I experimented quite a bit with yuzu: yuzushu; straight-up yuzu marmalade; yuzu-ginger apple ginger marmalade; yuzu-ginger marmalade; yuzu-blueberry conserve; and finally, yuzuhachimitsu. All turned out fairly well, but one remained in the jar until just the other day. The yuzuhachimitsu, a combination of yuzu, honey, and vinegar, echoes the recipe for the umehachimitsu. We adored the latter, and so I figured there could be no harm in trying this combination. But it looked a little scary, I must admit, as it sat in the laundry room. The fruit gradually turned brown and I sometimes mistook the yuzu seeds for mold. Afraid to look closer, I just left it be. However, with the advent of rainy season (officially declared yesterday and two weeks early) I knew the jar would be needed for this year's round of umeboshi. The smell emanating from the open jar was not inspiring, I confess, but I charged forward regardless. Distinctly yuzu with a sort of sickly sweet undertone, I felt a little nervous. Could this be a failure? Flashbacks to a recent bout of food poisoning made me cautious to try it, but risks must be taken. I made my husband drink it first. More sweet than sour, especially compared to the umehachimitsu's pucker inducing flavor, but with a distinct yuzu flavor he declared it a success. (He's drinking another glass now, as I type, and shows no signs of illness while continuing to rave about this new beverage.) My little sips have me thinking it would be nice mixed with sparkling water and maybe even with some mint or other herb to brighten it up a bit. 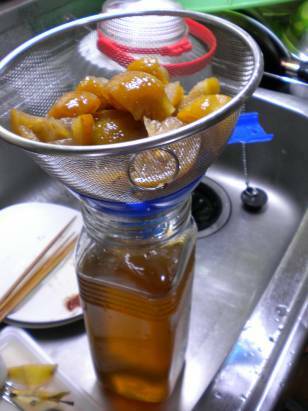 Got a favorite homemade fruit brew? Let's hear it! I'm always up for a new recipe to try. You are indeed daring :)... I'm not much into fruity drinks- but I'm always ready to try something new - at least for the first time. Well, my husband was more daring, thank heavens. He still looks good this morning, so we're feeling more confident than ever. Now it's time to get him to sample the kimchi! We brew a lot of aged Polish liqueurs. The alcohol kills any bacteria! Whoa there, Sheila! Let's hear some recipes! That sounds like a blast.